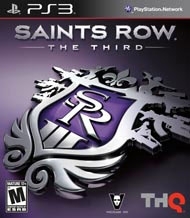 Saints Row: The Third is an action-adventure open world video game developed by Volition, Inc. and published by THQ. It was released on November 15, 2011 in Australia and North America, and was released on November 18, 2011 in Europe for Microsoft Windows, PlayStation 3 and Xbox 360. It is the third title in the Saints Row series, following on from 2008's Saints Row 2.
game will bleed you dry if you let it! easily find a new home. It was an Xbox exclusive game once. copies and the xbox 360 version 1mil? Waited long for this game for the ps3.